LittleBigPlanet 2 Set for a Special Japanese Announcement! Sony of Japan recently launched a new site with a countdown timer. A flash animation on the website shows a Mafia member slowly knitting something that is slowly beginning to look like a Sackboy. But with several excited users out there that couldn't stand the anticipation, the site's flash animation has been successfully decoded and some secret images were found in the website's source code that reveal it is indeed set-up for a Japanese Announcement of LittleBigPlanet 2. 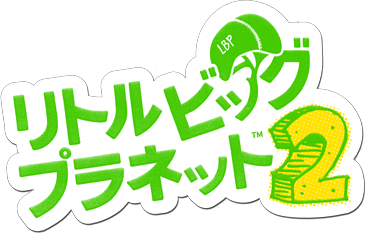 Of the images discovered, the only real unique one was a Special Japanese Version of the LittleBigPlanet 2 Logo (Shown Above). We'll make sure to keep you posted on all this exciting news over the Launch Information for LittleBigPlanet 2 in Japan! Visit the Japanese LBP2 Countdown Site by Clicking Right Here!